Through meditative practices, the ancient Taoist masters discovered a flowing current of energy in the human body. This Chi flow was found to follow fixed patterns through 60 major channels and approximately 365 points, or energy centers, where Chi gathers and condenses. The flow of Chi replenishes our life-force. Our body's energy points have both positive and negative poles that spiral subtle wheels of energy. These points serve as focal centers through which external forces are drawn in, absorbed, and transformed into life-force. Higher centers, such as the crown, spiral at a higher rate than lower centers. They slow down the incoming energy, like step-down transformers, regulating and refining Chi for the body's use. 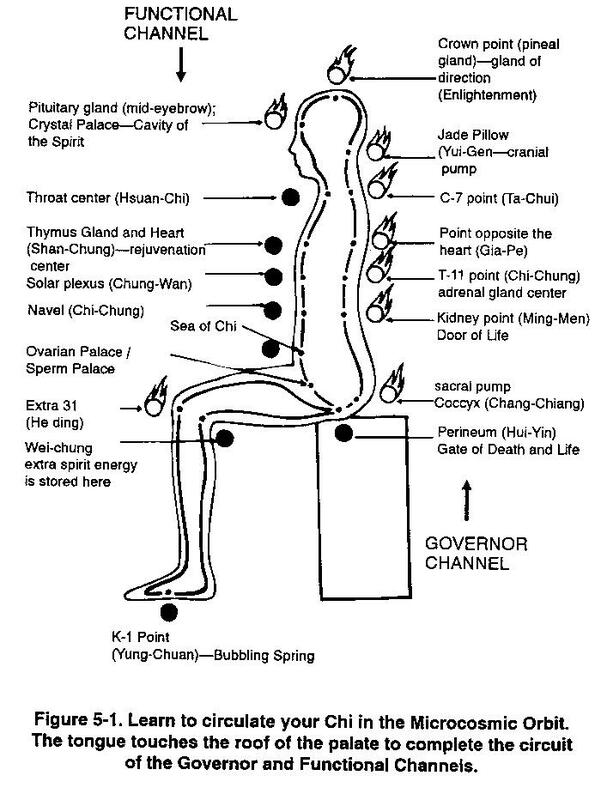 Each point produces its own quality of Chi to attract or repel energy from the other centers, to direct the Chi flow in a manner that connects the points, and to supply the proper energy to the entire body. Modern science now understands that this flow of human energy is actually an electromagnetic current. The body's many acupuncture channels serve as its "wiring," which guides the life-force to nourish the organs and glands. Chi is the link between the physical body, the energy body, and the spirit body. Knowledge of the energy flow in our bodies makes it easy to understand why the Microcosmic Orbit must be kept actively open to accommodate and enhance the movement of Chi. When we do not know how to conserve, recycle, and transform our internal force through this pathway, our energy consumption becomes as inefficient as a car that only gets five miles per gallon. By practicing the Microcosmic Orbit meditation, we can get in touch with our Chi flow and locate blockages or weak spots in its path so we can correct them. This will help us use our life-force more efficiently and achieve better internal "mileage." Joe N. Martin began his martial arts and healing work in the early ‘60s. He has studied many martial arts, bodywork techniques natural healing methods over the years. Grandmaster Joe Martin began teaching Martial arts in 1965 as assistant instructor with Sensei Bob Alexander and has had special training from many great masters from around the world. His knowledge of internal power and its application in martial arts will transform your art to a level far above your expectations in just a few hours. Grandmaster Martin will teach this extraordinary workshop to instructors and students. After the workshop has completed, he will offer the instructors additional internal power training that can be passed on to students or remain secrets of the instructors. Grandmaster Martin has had specialized training in Texas, New York, California, Europe, Canada, and China. Many of the extraordinary secrets taught in the workshop were handed down to Grandmaster Martin’s teacher, Mantak Chia by a Taoist monk (Master Yi Eng). It was Master Cheng Yao-Lun who taught him the Shaolin Method of Internal Power that was regarded as a national treasure of China.